A joining Report is a form that is prepared at the time of joining of an employee. There are many columns in joining report that must be carefully filled. After carefully filling all the columns it must be signed by the head of the office and then its copies must be submitted to higher authorities for their record. There are many reasons for the joining of an employee. I will discuss here all these with detail. 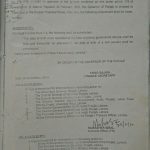 I here mentioned the copy of Advertisement, it is necessary as the Accounts Offices or CMA Office some times demands it to verify the eligibility of age for joining the new job. Medical Certificate must be obtained from the Civil Hospital duly countersigned by the MS of the same hospital. Pay and Allowances are granted to this employee from the date of Medical Certificate if the employee joins the duty on the date of medical certificate. If you join the duty on after noon then u will not get the pay for the same day. 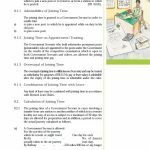 Joining Report is also prepared on promotion of an employee whether he/she posted in the same institution or the other. 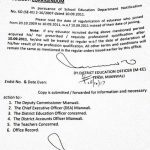 If an employee is promoted from back date then the joining date will be the back date as mentioned in the promotion letter. Joining Report is also prepared when employee is transferred from a certain institution. Here is to mention that the process and documents required may differ for various offices. Kindly also share method for preparing Stationary bill for AG office. what are the requirements for preparation of stationary bill. Thanks. Dear m Sharif I shall soon upload the same at my website. It Depends on the issuing authority mostly after the issuing date it is about 15 days but these may differ. 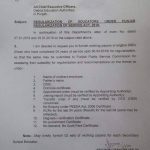 I have to know that if Assistant who is currently upgraded by goverment via finance deprt notification to bs-16 and if he now want to apply for his promotion or Re-designation of his post which belongs to bs-17,then is he eligible for that? I have selected as a stenotypist in FBR, RTO, Peshawar Office, I was working before this job in Pak Secretariat, islamabad as stenotypist. 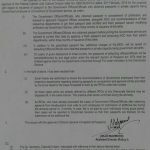 Dear Luqman, you have to produce LPC, Relieving Report, Service Book, Appointment letter, NOC (Department permission letter) etc for the same. According to my knowledge no need of Medical Ceritificate, however it is better you get the same as some one may object it having little knowledge. Nice and valuable information is available in this web site. please tell me when an officer is posted/transferred with the words that he is attached but draw his salary from some where other. The post is lower scale where the officer is attached. Is it true notification under rules? please guide. DEar Shahid, according to my knowledge attachement needs no vacant seat. Any one can be attached without the restriction of vacancy. I am very very impressed to see Galaxy World where a flood of information is available. I am also impressed, the work done by Ms. Shumaila Kamal. Wonder-ful Ms. Kamal. thanks dear for admiring mine little effort for employees. 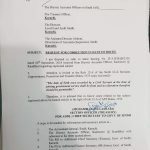 dear ... agr koi govt employee 2 domiciles use karte hoye pakra gia to iske service k sath kia hoga halanke os ne dosre domicile k sath post k lie apply direct kia tha na ke through proper channel.. ? mujhe kisi ne bataya hai k os per future govt employment per complete pabandi lag sakti hai..
Dear Ahmad mujhay is ki saza ka pata nahin hay. yes dear yeh bhi zaroori hay. lekan yeh alag topic hay i ll publish on this soon.